Bennett – Available for Adoption! 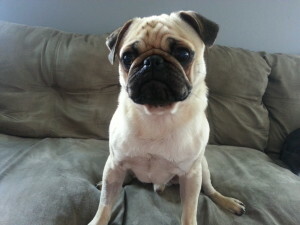 Bennett is only a year old and is slowly adjusting to life as a normal pug and not a puppy mill pug. He’s only a year old so he’s a playful little guy and pretty outgoing. He’s going to need some time to adjust to his forever home as he had a hard time the first few days with eating, but is now doing well. He does cower when he hears loud voices or when you stand over him, so he will need gentle words to gain confidence.